and lastly, a stylish twist to any classroom. Ikea’s trivet is super useful in the classroom because you can apply pushpins or staples and use it as a mini-bulletin display. Use old fabric, or buy scraps of fabric you really like, and upholster these bad boys! All you’ll need is a good pair of scissors and some glue or a stapler. You can use these as mini reminder boards behind your desk, or to display class items. Alternatively, attach magnets on the back so that they can sit snugly against the metal parts of your desk, or on the board. This is one of my favorites! 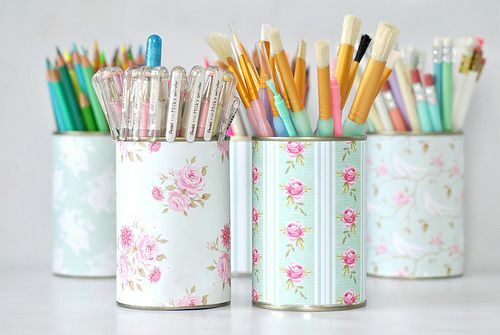 Instead of using a boring old pen/pencil caddy, use a cleaned out tin can, and cover it with your favorite decorative paper. You could use wrapping paper, scrap paper or even washi tape! I don’t recommend using cardstock because it wouldn’t have as much give. If you enjoy having flowers in your classroom, this is great way to tie that accent in to your classroom setting. 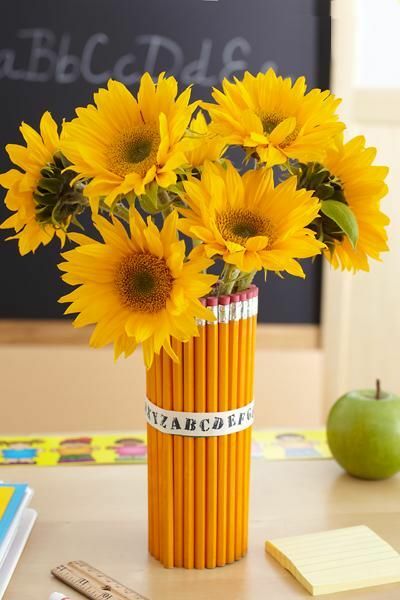 All you need is a long vase, a glue gun or double sided tape, unsharpened pencils or pencil crayons and some ribbon. What I love about this is: the frames featured in the picture below were actually wood frames (available at Michael’s) that have been spray painted. You could choose your own colors, and dress these frames up as much as your heart desires! Alternatively, you could purchase frames that are already made the way you like and save some time and effort. 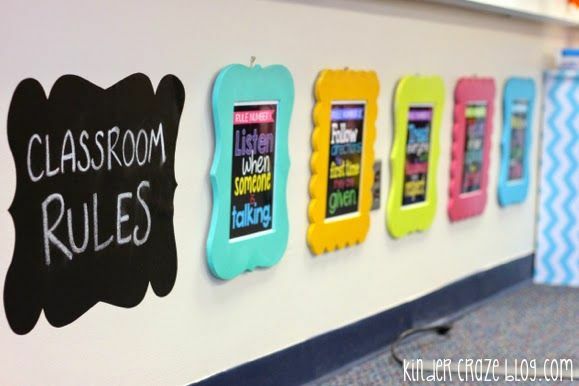 This is a surefire way to dress your classroom up. All you need to achieve the look below is some pretty scrap paper, ribbon and clothes pins…thats it! This look is so easy to achieve, yet so elegant. You can tie in colors that flow with your class design. What’s even better is that displaying student work with clothes pins is so efficient. 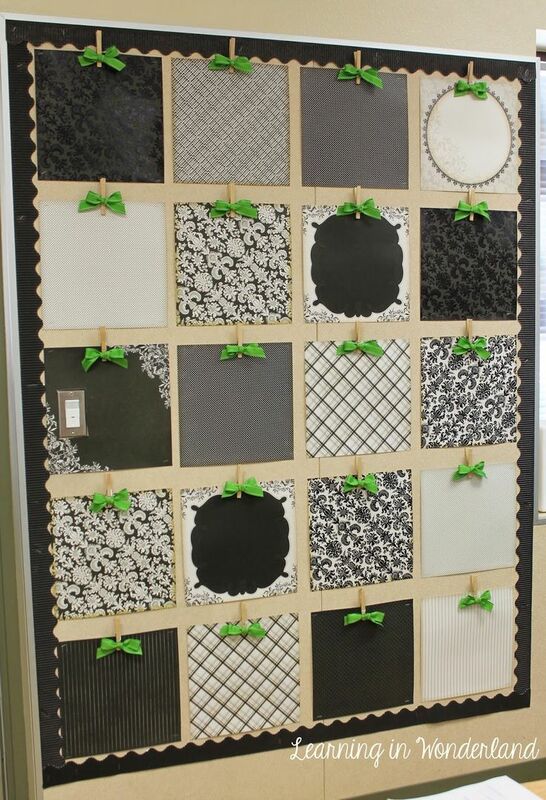 It requires no staples or push pins, so you wont be damaging your bulletin board backing or student work in the process. With some creativity, items that we think are out of date can be used in a whole new way! That’s what I love about this idea. 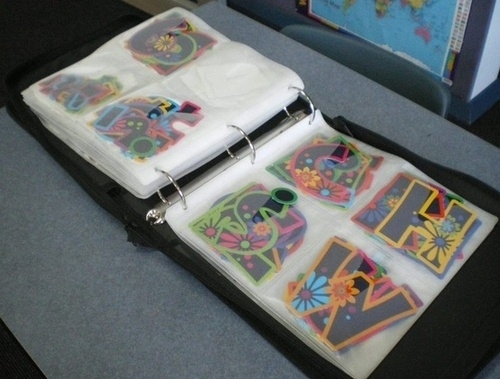 Take an old CD organizer and use it to organize your bulletin letters. This will have you saving time sifting and sorting through letters, and it will keep the letters in crisp shape. Also, this binder will fit vertically on any shelf, saving you some much needed space! How do you keep your classroom stylish?